The Oregon Department of Fish & Wildlife has confirmed four livestock depredations by the Meacham Wolf Pack of Umatilla County this month, all to the same livestock producer in the same privately-owned pasture. This is despite dedicated and substantial proactive non-lethal efforts to stop wolf-livestock conflict. The producer has removed dead livestock carcasses from the property the same day they were discovered; monitored and removed animals that were weak or could be a target of wolves; employed a range rider five days per week to monitor the location of wolves in the pasture and maintain human presence; modified their normal husbandry practices by putting larger, more mature calves in the pasture; and delayed pasture turnout for 30 days so calves were larger and to give wolves more time to move out of the area. Additionally, the producer has undertaken a speedy and expensive relocation of many of the cattle from the pasture where wolves are depredating. Normally, this private pasture would be used until October, but nearly 90 percent of cattle that typically use the area have been moved. Finally, for the past two years, the producer has chosen not to use their sheep grazing allotment on national forestland adjacent to the pasture to avoid potential wolf depredations. ODFW received a lethal control request from the producer on Aug. 21, after the fourth confirmed depredation this month. (An additional two depredations occurred in August 2016 and September 2014.) The producer requested that the entire pack be killed but ODFW has decided to take an incremental approach instead and has authorized the killing of two wolves from the pack initially to limit further depredations. While lethal removal will not target specific wolves in the pack, pups born this year will not be targeted. The Meacham pack is believed to have at least four pups this year, and has been a breeding pair (meaning at least two adults and two pups born in April survived through the end of the year) each year since 2014. At the end of 2016, the pack had seven members. There is no working radio-collar in the pack at this time, after one collar failed in November 2015 and another collared wolf dispersed from the pack in December 2015. During August and September 2015, 50 percent of the radio-collar locations of the two collared wolves were on the same piece of private land where the depredations are now occurring. 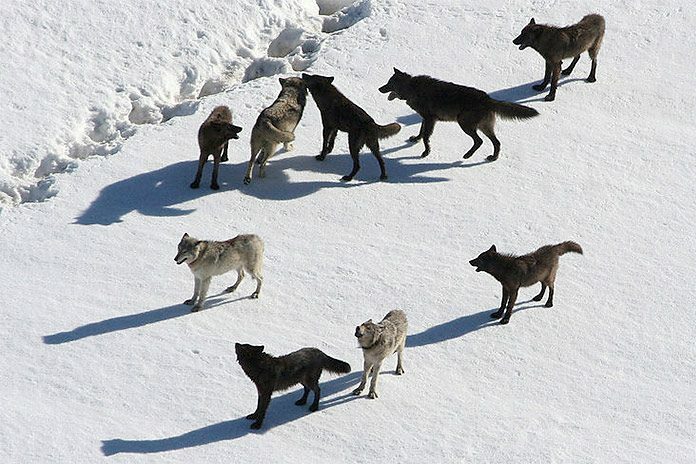 When non-lethal deterrence measures are not sufficient, the state’s Wolf Conservation and Management Plan allows for lethal control as a tool to address continuing depredation. At the request of a producer or permittee, ODFW can consider lethal control of wolves under these circumstances: if ODFW confirms at least two depredations of livestock; if the requester documents unsuccessful attempts to solve the situation thru non-lethal means; if no identified circumstance exists that attracts wolf-livestock conflict; and if the requester has complied with applicable laws and the conditions of any harassment or take permit. ODFW may kill the two wolves but the department will also provide the producer with a limited duration Wolf Kill Permit. This permit allows the producer to kill the two adult or sub-adult wolves (not pups) on the private land where depredations have occurred and does not require the wolf to be “caught in the act” of biting, wounding, killing or chasing livestock. Among other terms of the permit, non-lethal measures must continue and there can be no attractants (such as bone piles) on the property that might attract wolves. After the initial lethal take of two wolves, the situation will be monitored to determine if further depredations or testing/chasing of livestock occur and additional lethal control is needed. ODFW is also currently engaged in a lethal control operation for the Harl Butte Wolf Pack in Wallowa County, also due to chronic livestock depredation. To date the agency has taken three wolves out of that pack.